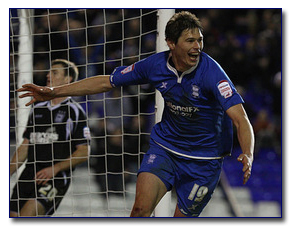 A Nikola Zigic brace saw Birmingham City run out 2-1 winners against Ipswich Town last night at St Andrew’s. The Serbian striker headed his first goal in the 9th minute and then finished smartly at the death to lift Blues within two points of the play off positions with a game in hand. Ipswich Town’s Lee Martin fired in the Tractor Boy’s only response from 25 yards. Tired & Weary Top Trump Cards Updated – Click Here. This entry was posted in Tired and Weary and tagged bcfc, birmingham city football club, championship league table, ipswich town, nikola zigic. Bookmark the permalink.